A wonderful one stop shop for all things girly, glittery, sparkly, frilly and special. Candy Bows was started in 2009 by Charlotte Mackenzie, a mummy of twin girls and was born from a desire to find good quality and traditional hair accessories which were impossible to find on the UK high street along with a dream of working for herself whilst bringing up 3 small children….. 8 years later the dream has come true. What started with a range of handtied hairbows has now developed in to an international company. Candy Bows is now based just outside Harrogate in the beautiful countryside of Yorkshire and the team is made up from mums and friends who also want to work ‘around the children’ whilst having fun. Our happy and rather noisy workshop and office is filled with laughter and more often than not in the school holidays with Charlottes children who help pack orders as well as staring in the photo shoots. Here at Candy Bows we have classic, traditional style bows for everyday wear, school wear, multi patterned bows for parties and a fabulous array for special occassions. We aim to keep all our accessory products at ‘pocket money’ prices so that we can appeal to the little girls that wear them without costing Mummy too much. The bows and clips are great to give as gifts or be bought purely to indulge your own little girl and each and every hair accessory is handmade by highly-skilled artists with the highest quality of materials. Our pettiskirt range brings lots of smiles to girls everywhere and we have found there are lots of different looks with just one skirt – a classic look, a rock chick look and with teenagers wearing them now, a festival look too. 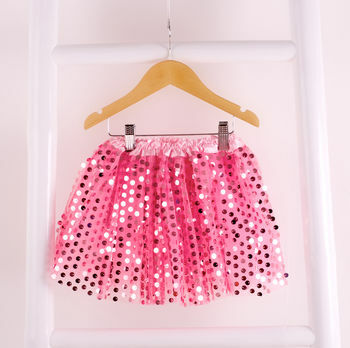 You will also find a wonderful array of tutus, sparkly wings and tiaras and diamante t-shirts within our online shop. "Tutu is beautiful and one little girl is very happy!" "Gorgeous. I'm wishing It went up to my size..hee hee. 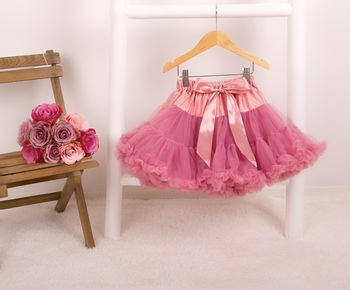 That tutu is certainly going to make a little Princess very happy :)Thank you for the rapid delivery and excellent packaging. X"
"Lovely outfit, perfect for a little girls dressing up box and wrapped in lovely pink tissue"
"Charming little presents for two of our younger grand daughters. They're very pretty indeed and bring the finishing touch for little girls who like pretty things." Goods are delivered within 2-3 working days. Personalised items take 5-6 days.